There tends to be a gray area perception when it comes to rulings pertaining to the waving of red cross flags. One year ago, there was an instance where Davi Millsaps was actually passed on the flag and nothing was enforced. In that same race a penalty was administered to Ryan Villopoto, but was implemented on the red flag restart as opposed to the end of the race as one would expect. Millsaps lost points and was hampered by those results. Rockstar Energy Racing was once again involved with similar controversy this weekend during the second of three trips to Angels Stadium. 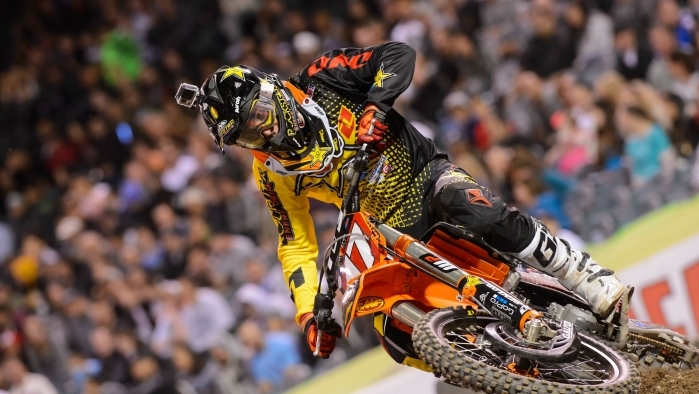 Jason Anderson has experienced a stellar start to the 2014 season, going undefeated in the first two rounds. Anaheim 2 started much the same way with Jason recording the fastest practice qualifying time and backing that up with a heat race win. His main event started with a little more adversity this week however. Exiting turn one, Justin Hill went down entering the first rhythm section as his bike landed perpendicular to the track direction, blocking nearly half the lane. Anderson barely squeezed in between the bike and the tough blocks on the edge of the track. He then had to avoid Hill who was dodging bikes trying not to get run over. Finally after staying up after that, JA was forced to single the big turn double at the end of the straight. He was mired in the back and had a lot of ground to make up on Cole Seely who was out front. He moved through the pack so quickly, it was almost as if there was no one there. Jason made his way all the way into 2nd place and the stage was set for another possible last lap dramatic pass. There just wasn't enough time this week though as Jason cut the distance in half but was unable completely close the gap. He was able to secure the 2nd spot on the podium though and remain the points leader. That was until of course the controversy struck. According to officials Anderson had jumped on a red cross flag in the middle of the race. A ruling that was made on an opinion and still leaving questions over whether or not it was valid and perhaps even why he was the only one under scrutiny. Anderson was docked 2 positions, stripping him of the points lead and the red plate. The decision was final and there is nothing that can be done but to move on. Jason is now more fired up than ever and has always been very fast in Oakland where the next round will be held. Jason anderson: "Today was alright, I salvaged a 2nd but received a penalty and was docked 2 positions. I felt like I still dodged a couple bullets tonight and I need to keep my momentum going. I want the championship at the end of the year." Ivan Tedesco is still continuing to improve. His speed is getting better and that was evident Saturday night. One thing that was holding him back this time was his starts. Usually a very good rider off the line, that was just not the case at A2. He was forced to come through the pack every time he lined up. Even with that issue, he was still able to qualify out of the semi, thus avoiding the treacherous LCQ. He again was near the back of the pack at the beginning of the main but he put his head down and moved forward. He was able to get as far up as 13th where he finished. Perhaps the challenges he faced will actually be something to build on. As mentioned in prior reports, race pace is much different than what can be focused on during the week. Even harder is maintaining that while moving through the field and being forced to change lines and really focus on looking and planning ahead for every pass. Possibly easier said than done, Ivan just needs to put a few things together and he will be where he belongs. Tedesco is a veteran though and a hard worker, so the results will soon come as well. Ivan Tedesco: "Weekend was decent, track was really tricky and it took me a while to figure it out. I was still figuring it out even in the heat race and the semi. I made it through in the semi and then in the main I got a bad start once again. I was kind of struggling with my starts all day. I kind of had to fight for it. I battled through for a 13th which is not where I wanna be, but with the bad starts and stacked field it's kinda tough. I need to work on my starts this week and gain a little bit of speed to hopefully get into the top 10." Cole Thompson appears to be improving, but he is still a young kid racing in a 450 class teeming with a cast of wiley characters. It's a tough task to even qualify for a main event. Thompson still has only been on the bike for a very short time and just needs to stay positive, work hard during the week and learn from the multiple mentors surrounding him. He missed out on qualifying for the main event for the second week in a row. Anderson is going to use the fire inside of him and aim to retrieve the red plate next week. Tedesco will work to find his way into the top ten in Oakland and similarly Thompson's goal will certainly be to put his KTM 350 into the main event. *Note: Jason Anderson was penalized two spots for jumping through a section while red cross flags were out.